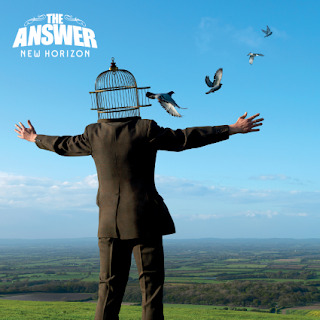 Due for release at the end of September, The Answer's upcoming new album, "New Horizon", should please both fans of old and new. Produced by Toby Jepson (Little Angels) and mixed by Mike Fraser (AC/DC, Metallica), "New Horizon" is the killer sound of rock and roll all revved up and ready to go! With the soon-to-be released "New Horizon" making it album number four for these Northern Irish rockers (time flies when you're having fun after all! ), if they weren't a household name before this album then The Answer should be shortly! Here we are looking at a 4-piece band that is all dolled up and ready for the party to begin. All that's needed is an eager listening audience that's been craving real rock and roll. If that sounds like you then have no worries. Your appetite will soon be taken care of seeing as The Answer's upcoming LP reads like a how to manual on the proper way to create a real rock and roll album! Simply put "New Horizon" sounds like a down-right killer rock and roll album so if you're looking to add a new name to your collection then look no further. As "New Horizon" unveils itself for the listener in such a smooth fashion it comes across as more of a long lost classic rock album than one assembled in 2013! And that's not easy folks! As for the four guys behind this album you might be asking? Well, guitarist Paul Mahon, whose father was a renowned jazz trumpeter in his native Ireland, actually formed The Answer back in 2000, but it would take a little while before the group's first-album would be released. That's getting a bit ahead of ourselves though so let's get back to how guitarist Paul Mahon first put this group together. Enlisting his school chum Micky Waters as a bassist, the band would soon enough be rounded out by the talented lead vocals of Cormac Neeson and the mad drumming skills of James Heatley. With Paul Mahon providing the same sort of lead guitar solos that made rock and roll so dangerous to the establishment to begin with (in other words his guitar playing is crafted from the spirits of bands like Cream and Deep Purple as well as artists like Jimi Hendrix) and bassist Micky Waters burning the house down with some meaty riffs it was pretty obvious from the start that this 4-piece had good things in store for the listening public. For whatever reason though it did take a little time before they were able to pull-off a studio release. The band's 2006 debut album, "Rise", (which has yet to see an official release here in the US oddly enough) was certainly a long-time coming, but it proved to be more than worth the wait! "Rise" would end up on the receiving end of almost universal praise as would it's follow-up, 2009's "Everyday Demons". When it came down to the group's last album, 2011's "Revival", it was pretty much the same deal as the band's classic rock-tinged hard rock had appealed to those longing for the good old days when rock and roll was more about sound and less about image. With "New Horizon" it's more of the same, which isn't a bad deal at all when you're talking about rock and roll like this, only this time around it seems much more refined as if The Answer has just about perfected their own individual sound! The group's influences, which run from A (AC/DC) to Z (Zeppelin), seem less noticeable on their forth album as if these four guys are finally taping into their own groove. Even if their potent brand of heavy rock/hard rock might still point an approving figure towards the likes of Thin Lizzy it's more as if The Answer is just acknowledging their roots then rehashing them. In the end "New Horizon" makes for a great listen. It's that plain and simple and, as such, it's a no-brainer for both fans of The Answer and those people who are always on the lookout for that old-fashioned, well-loved rock and roll sound! And speaking of which, this new album will be well-loved and duly appreciated by yours truly as it finds a way into my stereos heavy rotation section!